All in One Device. PSLab is a small USB powered hardware extension for your Android phone or PC that lets you measure all kinds of things. PSLab comes with a built-in Oscilloscope, Multimeter, Wave Generator, Logic Analyzer, Power Source, and we are constantly adding more digital instruments. PSLab is many devices in one. Simply connect two wires to the relevant pins and start measuring. You can use our Open Source Android or desktop apps to view and collect the data. You can also plug in hundreds of compatible I2C standard sensors to the PSLab pin slots. It works without the need for programming. So, what experiments you do is just limited to your imagination! 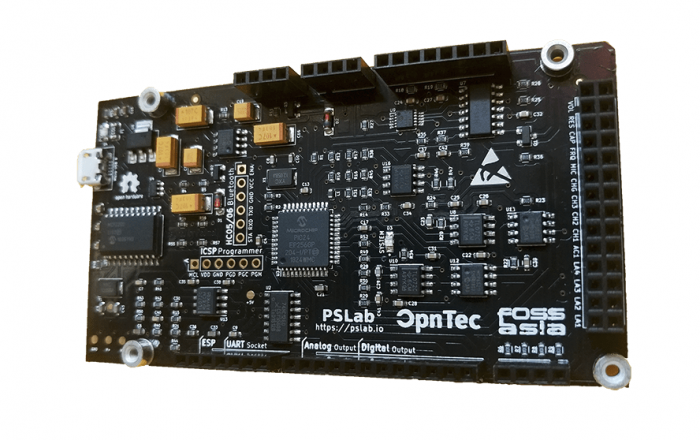 PSLab is developed by FOSSASIA and OpnTec in collaboration with a global community of Open Source developers.